We encourage you to share your member news with us (transitions, verdicts, etc.). Submit news items to: info@lakc.net. The Young Lawyers Section of the Lawyers Association of Kansas City is now accepting applications for the 2018-19 Board of Directors. Interested candidates should complete the attached application and return on or before April 30, 2019 to Ashlee Crowl, ashlee.crowl@gmail.com. Elections will be held Wednesday, May 8, 2019 at 5:00pm @ Chicken & Pickle, 1761 Burlington, North Kansas City MO 64116. The Lawyers Association of Kansas City (LAKC) was founded in 1935 to promote and advance the following objectives that are just as relevant today: the welfare of the public in the greater Kansas City Community; the administration of justice; the science of jurisprudence; and the cordial and professional relations among the members of the greater Kansas City Bar. The Young Lawyers Section of LAKC is comprised of members under 35 or who have graduated from law school within the past five years and maintain “service of public interest by advancing the role of the legal profession in serving the public” as a value. 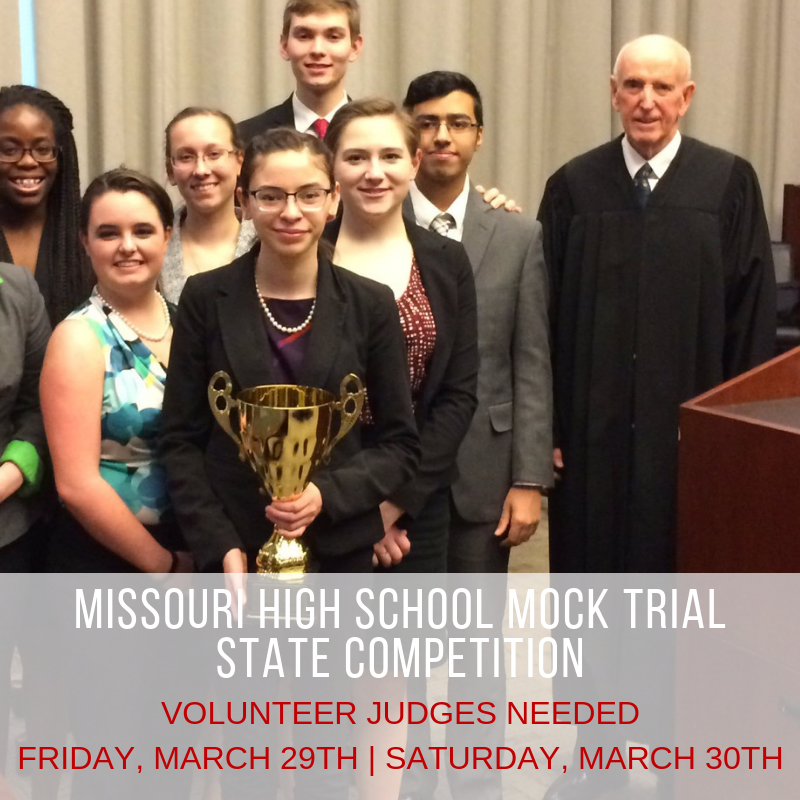 Meals are provided for judges and up to 6 hours self study CLE credit can be claimed in MO. This is a great opportunity to see how enthusiastic these high school students are about the law, and can reenergize and remind us why we love what we do! 1. All prospective jurors shall complete the online informational questionnaire available to them through eJuror as directed by their summons. The prospective jurors forming a petit jury panel in any case shall have the bioforms resulting from their completed questionnaires compiled by court personnel, who shall print three copies of the panel's bioforms. The Court shall retain one copy and give one copy to the attorney representing the plaintiff and one copy to the attorney representing the defendant. The prospective jurors forming a grand jury panel shall have the bioforms resulting from their completed questionnaires compiled by court personnel, who shall print two or three copies of the panel's bioforms. The Court shall retain one copy and give one or two copies to the attorney(s) representing the state. 2. Upon conclusion of the trial, the Court's original jury panel list shall be placed in the court file and the Court's copy of the jury bioforms for the entire panel shall be placed in a sealed envelope, that is labeled with the case name, case number, division and dates of trial and shall be returned to the Jury Room for retention. Upon the selection of the grand jury, the originals of the jury bioforms for the entire panel shall be placed in a sealed envelope and returned to the Jury Room for retention. All jury bioforms shall be maintained as a closed record and shall not be disclosed to anyone except upon order of the court and for just cause. 3. Upon the selection of a petit jury, the copies of the jury bioforms provided to the attorneys shall be returned to court personnel and shall be destroyed. Upon the selection of a grand jury, the copies of the jury bioforms provided to the attorney(s) for the state shall be returned to court personnel and shall be destroyed. 4. The Presiding Judge is authorized to enter an order, pursuant to Supreme Court Operating Rule 8, ordering destruction of juror bioforms delivered to the Jury Room for retention as closed records, upon the expiration of ten years after the trial date or grand jury selection, without further order of the Court. Each year, the LAKC-YLS board awards a one-time scholarship to provide college financial assistance to an outstanding graduating senior who has expressed or demonstrated a sincere interest in pursuing a law-related career. The scholarship amount this year is $1,000. Applications are due no later than April 9, 2019. Please see the attached application for additional details. The Young Lawyers Section of the Lawyers Association of Kansas City will hold its board elections Wednesday, May 9th from 5-7pm at Char Bar, 4050 Pennsylvania, Kansas City MO 64111. The slate of officers and directors up for election are provided in the ballot below. Members are encouraged to cast their votes during the annual meeting event at Char Bar. Ballots may also be submitted to JR Montgomery by e-mail to james.montgomery@stinson.com or by U.S. mail to ATTN: JR Montgomery, Stinson Leonard Street LLP, 1201 Walnut St., Ste. 2400, Kansas City, Missouri 64106. Ballots, whether sent by e-mail or U.S. mail should be received prior to 5p.m. on May 9, 2018, to be counted. The Young Lawyers Section of the Lawyers Association of Kansas City is now accepting applications for the 2018-19 Board of Directors. Interested candidates should complete the attached application and return on or before April 25, 2018 to JR Montgomery (james.montgomery@stinson.com). Elections will be held Wednesday, May 9, 2018, 5:00pm @ Char Bar, 4050 Pennsylvania Avenue, Kansas City MO. * Those 75 years and older can be excused from jury duty if they ask (HB2063). * Registered sexual offenders are not permitted to partake in any Halloween related activities with children on October 31. This common sense bill filed by Rep. Ellebracht removes the October 31 qualifier (HB1306). * Allowing courts to approve settlements involving minors on the basis of affidavits. The law currently requires an evidentiary hearing. Under this bill the court could still hold a hearing in its discretion. (HB1405). This was presented last year also as HB 592. * Removal of the statute of limitations on prosecution of unlawful sexual offenses. (HB1590 and 2185). The law currently provides a 30 year statute of limitations. Public hearings were held last week. This is the same as HB1120 from last year. * Allowing municipal convictions, guilty pleas and nolo contendere pleas to be used as evidence relevant to witness credibility (HB1681). In order words, there would be no exception for municipal court findings and pleas. A public hearing was held last week on this bill, which is the same as HB735 from last year. Please note that to be considered, applications must be postmarked or scanned and e-mailed to the address or e-mail address listed in the application instructions no later than April 10, 2018.